I've had the privilege of being friends with the ultra creative and crafty Karla Ann and over the years I have received some pretty cool gifts from her. However, there is one that stands out in my memory. I believe it was the year we graduated from college. She was either working part time or not yet working - so she had a lot of time on her hands :) One day, she told me she had the best idea for my Christmas gift. However, it was going to take a long time to make it, so I'd need to be patient. But...it would be sooo worth the wait. I was curious. I asked questions. I asked for progress reports. I waited. One of my favourite pages. She has a sense of humour! Christmas came and went and the gift was not yet ready. What could she possibly be making? Well, it wasn't until the next Christmas that I finally discovered what she had been working on. I was quite pleased with my gift for her that year. I had found a Vincent Van Gogh doll (with detachable ear) and Van Gogh mug that made his ear disappear when you poured hot liquids into it. I was pumped...she was going to love this gift. And she did! But, then I opened my gift. It was the gift. She had created a 365 day flip calendar with each page being a different memory. She had carried around a notepad in her purse and when something would come up, she wrote it down. It contained birthdays of people that we like, snippets from our past and even a video tape. (yes...it was that long ago) On days with a TV on the page, I got to watch what was on the tape. It was insanely creative and awesome. 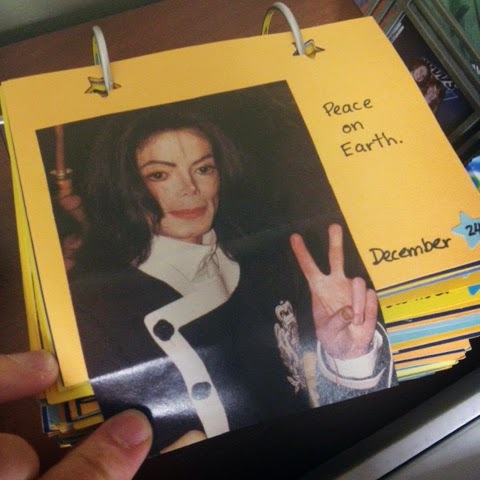 I still have this calendar on my desk at work.